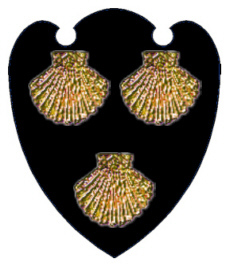 Coat of Arms: Black with three escallop. 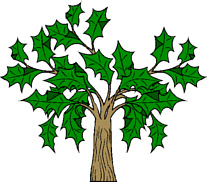 Crest: A bundle of holly. Motto: "Honour is the prize of honesty". Badge: A white horses head. Following submitted by Mrs. Richard Bailey: Strickland Territory: The name Strickland is historically associated with Westmore in the north of England where it is on record since the twelfth century. By the sixteenth century branches of the family were well established throughout Westmorland, Cumberland, anf Yorkshire with seats at Sizergh and Boynton, later at Flamborough, and today the surname is widely found in small numbers though it remains chiefly of note in its original homeland. Strickland settlers are recorded in Ireland in the seventeenth century, and the name was of note for some years on Waterford, Kildare, Wicklow and Dublin. 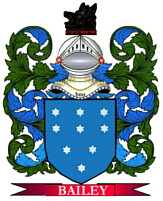 Griffith, working in the nineteenth century, located the surname chiefly on Offaly. Meaning: The name is derived from the Westmorland village of Strickland and denotes simply ' of/from Strickland' or 'dweller at Strickland'. The village name itself is derived from the Old English 'styrc-landa' meaning 'land or field for bullocks and heifers'. Ancestors: Uchred de Stirclanda of Westmorland is recorded as early as 1193. Robert de Stirkland ( Henry 111 ) gave the Manor of Great Strickland to his son William on his marriage; the latter is presumably the William de Strikeland who appears in Westmorland documents in1278. Another William Strikland was Bishop of Carlisle 1400-1419. A Walter Strikland is recorded in Londen in 1442. Roger Strikland of Marsk in Yorkshire ( tempi Henry V111 ) wasthe father of William Strikland (died 1598) of Boynton who married a cousin Elizabeth, daughter of Sir William Strikland of Sizergh; he was the grandfather of Sir William Strikland who was summond to Parliament by Cromwell as first Baronet Strikland and who acquired lands at Coshmore and Coshbride in Waterford, Ireland, under the terms of the Cromwelian settlement of 1642. A Richard Strikland of Naas left a will dated 1661, and Francis Strikland of Wicklow left a will on 1727. Coat of Arms: On a red field, the heraldic colour of valour and military fortitude, and between three white Crosses for faith and fedelity, is a yellow chevron symbolising protection; on an ermine canton, or square of honour, is a STAG's head, an emblom of WISDOM AND POLICY. Spelling variations include: Strickland, Stirkland, Stickland and others. First found in Westmoreland where they were seated from very ancient times, some say they were descended from the Norman Earls of Northumberland. Some of the first settlers of this name or some of its variants were: Henry Strickland settled in Virginia in 1670; along with Joseph; Henry Strickland settled in New Jersey in 1769; Hugh Strickland settled in Wilmington, Del. in 1789.